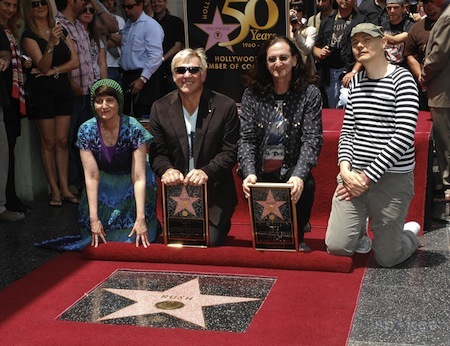 Donna Halper gave Rush a helping hand when the band earned a star on the Hollywood Walk of Fame in 2010. She’s the woman credited with discovering the band Rush and crashing through stereotypes set for female DJs in rock radio. Meet Donna Halper — music aficionado, fearless leader, game-changer and all-around superwoman. In 1974, Halper was working at WMMS in Cleveland when she opened an album sent to her by Canadian record promoter, Bob Roper. Loving what she heard, she played a track for listeners called “Working Man” off the unsigned and unknown band’s album. After Halper gave the Canadian trio called Rush a spin, the band’s luck began to change. Other radio stations jumped on Halper’s bandwagon and started playing Rush songs. By the end of the summer of 1974, Rush had a U.S. recording contract. Without the help of Halper, would Rush have ended up as just another Canadian bar band? We’ll never know the answer to that question, but what we do know is Rush has gained respect as one of the greatest rock bands of all time, including snapping up a nomination for the 2013 Rock & Roll Hall of Fame. The band still keeps in touch with Halper, whom they dedicated their first two albums to, and remain forever loyal to her for giving them their first big break. DJ Donna Halper in her early radio days. Halper never took “no” for an answer and became a pioneer for women in rock radio. Howl in Lowell’s Nick Tsui recently sat down with the legendary radio Goddess in a Cambridge coffee shop, where Halper — also a college professor and published author — was nice enough to share details about her groundbreaking career in radio and longtime friendship with Rush (the band will play Boston’s TD Garden Wednesday, Oct. 24). Q: What first got you interested in radio? I was a lonely kid. I was also Jewish without anyone to relate, so the radio was my friend. It seemed like the DJ on the other end was talking to me. It made me feel better, so when I was young, I knew that’s what I wanted to do. I wanted that to be my career. In the 1950s though, a career was not a common thing, but it was personal. I just knew I wanted to make a difference. Q: Who were some of your inspirations that helped shape who you are today? Being a female trying to be a DJ was not opportune. I grew up on the edge of the women’s movement and told I couldn’t do it for radio. Northeastern University turned me down flat. I didn’t even get an audition. It took four years of determination and being relentless. Luckily, I had a couple of people who believed in me. I just kept rejecting the message that a woman couldn’t do this line of work. I was a feminist before it existed, attempting to work and change things for myself and women as well as the men that came after me. One thing I wanted to know was — have there ever been any female radio DJs? And the answer to that was ‘yes’ and as far back as the 1920s. That became the subject of another book; telling the stories of pioneers that were forgotten and also the men who helped them, such as Bob and Maria Zimmerman from Iowa. Maria was one of the first women to own a radio station and Bob was 100 percent supportive. He built it and she ran it. Q: You became the first woman announcer at Northeastern University’s campus radio station. You’ve worked in Cleveland, New York City, Washington D.C. and Boston, expanding the horizons for women in radio, and you’ve written several books. What is your career highlight? Discovering Rush changed my life. That is my greatest career highlight, although I didn’t know it at the time. I was given an album by a Canadian promoter, but as a music director it’s your job to find new bands. And 99 percent of the time it’s the same thing; you’ll give a band some airplay, help their career along and never hear from them again. I never expected to hear from Rush, but here we are 38 years later. They’ve kept in touch and are down-to-earth people. They’re also an incredibly loyal band. The crew that work for them have been there since day one or are the kids of people that have been employed with them. I was just a working-class kid from Dorchester and Rush has helped my career and has given me a chance to do things I never thought [possible]. Q: Why do you think it took so long for Rush to get a nomination for the Rock and Roll Hall of Fame? I understand that they don’t appeal to everyone, but that’s not what this is about. I love them, but it’s about being fair. They have almost a 40-year career, created new and relevant music each year, made millions of fans all over the world happy, and continue to rock. I’ve made calls, petitioned, wrote letters, you name it. They were the band critics hated and fans loved. People with nomination power in Cleveland wanted them in but people from New York didn’t. Q: For the first time ever, a fan ballot will be taken into account for the Hall of Fame induction. Do you think the fan ballot is a good idea? Yes! Rush fans are hungry for this. As of now, they’re leading all the other bands and artists in terms of that vote. Q: The Hall of Fame has been infamous for not inducting artists from certain genres (like metal). Do you think there will be a major shift of inductees in the coming years? Yes, absolutely! The winds are definitely shifting. There are new chairs on the board. It’s out with the old and in with the new! [Metallica manager] Cliff Bernstein is on the board now and he’s the one who got Rush signed to Mercury Records and made them a priority. According to him, “Rush would be lost” if they signed with the other labels offering a contract. Rush has been eligible for 14 years so when I heard he was on the board, that’s when I knew. Q: This year, Rush released their new album, Clockwork Angels. What are some of your favorite tracks? I really enjoy The Garden. The creativity of this band is amazing. Just when you think they’ve gone as far as they can, they go farther. It’s a moving piece of music and they continue to make it without compromising their sound. It’s a softer sound but it’s still Rush. Q: Is there anything you’d like to see Rush do in the future? Re-record earlier material, a smaller theatre tour, acoustic versions of songs, etc? I’m happy with everything they’ve done. As long as they’re happy and true to themselves, I’ll be there to cheer them on. They’ll know the right moves to make when they do — they’ve reinvented themselves, adapted, and expanded their musical visions over and over. Alex Lifeson, Geddy Lee and Neil Peart of Rush are still rocking legions of fans around the world in 2012. Q: Alex Lifeson recently made the new Rolling Stone greatest guitarist list. He also placed 3rd in Guitar World’s list, beating out Tony Iommi, Frank Zappa, and Steve Howe among others. This all happening with Rush’s nomination, would you say the band is finally getting the credit they deserve? What you’ve got to realize is that there’s a whole new generation of Rush fans out there. I’ve met people that learned English just to better understand their lyrics and music — people from Chile, Norway and even Japan. Volkswagen approached Rush to use the song “Fly by Night” for a commercial. They didn’t shop that song. It was just another fan’s idea. Moms and dads are now introducing their kids to the music. And they keep going because it matters to the fans. That was one of the reasons Geddy told me they keep performing. They’re musicians because they want to be. In addition to Rush, the other 2013 nominees are: Deep Purple, The Paul Butterfield Blues Band, Chic, Heart, Joan Jett and the Blackhearts, Albert King, Kraftwerk, The Marvelettes, The Meters, Randy Newman, N.W.A., Procol Harum, Public Enemy and Donna Summer. Be sure to cast your votes at the Rock and Roll Hall of Fame online fan poll here. Nick Tsui eats, sleeps and breathes music. With his acoustic Takamine in tow, over the past seven years the 27-year-old has traveled the country in search of some of the greatest guitar legends of all time including Bo Diddley, Les Paul, Buddy Guy, Jeff Beck and BB King — just to name a few. Today, Nick’s guitar is tattooed with the signatures of more than two dozen of his guitar heroes. Nick lives in Dracut and attended school at UMass Lowell, where he studied psychology. Besides collecting music and interviewing the players, Nick provides food for the music-lovers soul at HOWL, and also writes for The Blues Audience Newsletter. Give him a shout at nick@howlinlowell.com.